A two days convention recognizing the importance of the practice of handicrafts was officially opened last week at the Fa’onelua Convention Centre. The Cultural Tourism Convention which was held on Wednesday 21st & Thursday 22nd of May, 2014 was officially opened by Her Royal Highness Princess Mele Siu’ilikutapu Kalaniuvalu Fotofili. Present at the official opening was the Prime Minister, Lord Tu’ivakano, Minister of Commerce, Tourism and Labour Dr. the Hon. Viliami Uasike Latu, His Excellency Dr. Kazuchika Hamuro, His Excellency Mr. Huang Huaguang and representatives from the diplomatic corps offices in the Kingdom. During the Honorable Minister’s welcoming speech, Dr. Latu thanked Her Royal Highness for honoring the people through her presence at the convention. He also thanked the Prime Minister for the support made for the livelihoods at the grassroot level through the Ministry of Commerce, Tourism and Labour grant scheme and other Government strategies. The convention began with a float parade along the main roads of Nuku’alofa showcasing the different handicrafts from the various women’s groups highlighting the works of the artisans who participated. A number of nominated elderly women who still practice and make handicrafts (over 80 years old) were also recognized and introduced during the opening ceremony this was followed by group discussions which was chaired by Her Royal Highness Princess Mele Siu’ilikutapu Kalaniuvalu Fotofili. The goal of the meetings were to discuss how cultural tourism can shift development towards more sustainable livelihood opportunities. 1. To build the momentum of support by a wider group of stakeholders. 2. To identify possibly collaborations and secure commitments from participants to mainstream initiative into national, regional and international sustainable development agenda. 1. Situation analysis and key challenges identified. 2. Renewed support of outcomes. 3. Better understanding of the opportunities that exist and are emerging to elaborate and implement.4. Identification of the possible institutional framework will be required to support sustainability.5. Galvanize support and commitments from participants. Over 300 participants from various villages in Tongatapu, Vava’u, Ha’apai and ‘Eua were able to participate through the Ministry’s grants to help handicrafts artisan. This is the first in many respects as participants expressed their delight in discussing their livelihood of many in the grassroot level. The Ministry of Commerce, Tourism and Labour through its continuous efforts to develop tourism and trade in Tonga highly regards handicrafts as a key sector which compliments the efforts made by handicrafts artisans. The Government of Tonga with the assistance of the International Finance Corporation (IFC), a member of the World Bank Group, is seeking proposals from private sector parties interested in undertaking the renovation, upgrading and future operation of the International Dateline Hotel in Nuku’alofa, Tonga. Established in 1966, the government-owned International Dateline Hotel is the largest in Tonga, with 125 rooms and it will become the country’s first international-standard three-and-a-half to four-star hotel following its refurbishment. 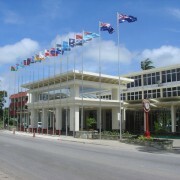 IFC has been engaged by the Government of Tonga as lead advisor on the structuring and implementation of a public-private partnership for the renovation and ongoing management of the hotel, which is known for its position on the International Date Line, 12 hours ahead of Greenwich Mean Time. Parties who have registered their initial interest will be provided with an Information Memorandum and further information on how to submit their proposals, including the selection process and timeline. As the first step of the selection process, respondents will be required to submit qualification criteria that will comprise evidence of financial strength, relevant development and construction expertise, and hotel management and operation capability. The Government of Tonga is launching a second market-sounding exercise in order to find potential partners for the renovation and management of the International Dateline Hotel following the end of negotiations with Tanoa Hotel Group. The Minister for Finance and National Planning Dr. ‘Aisake Eke stated that the “development of the International Dateline Hotel plays a key role in the future of Tonga’s tourism industry and therefore Government is committed to finding a suitable private sector partner to undertake this historic project, and to ensuring Tonga realizes its potential through increased tourism and jobs for its people.